Every now and then a Conservative defender of capitalism tries to argue that Nazism and Fascism were forms of Socialism. Jonah Goldberg tried it a few years ago in his book, Liberal Fascism, a Tory MP stood up in the European parliament a couple of weeks ago and made the same accusation, though he had to take it back and apologise. And Private Eye in recent weeks have also published a couple of letters from readers making the same claims. Fascism did have Socialistic elements. Mussolini was originally a radical Socialist, who broke with the rest of the Italian Socialist movement in supporting Italy joining the First World War. The Fascist party was originally extremely left-wing in its programme of 1919. Its corporativism was not only based on the ideas of the right-wing Italian Nationalists, but also from part of the syndicalist movement, which moved away from demanding absolute workers’ control to advocating an industrial structure which included both capitalists and workers in a series of corporations set up to govern each industry, or sector of the economy. The Nazis also included socialist elements in their 1922 programme, such as the nationalization of firms and profit-sharing in industry, as well as the break-up of the department stores. However, the Fascists and Nazis came to power through their alliance with business and the aristocracy. Both the Italian Fascists and Nazis in Germany were hostile to socialism, communism and workers’ trade unions. In Italy, they also allied with the Vatican to destroy the Populists, a party set up to represent Italian Roman Catholics against persecution by the Liberal state, which was distrusted by the Papacy because they considered it too radical. Once in power, the socialist elements of these parties’ programmes was soon jettisoned. Hitler declared that he had no intention of nationalizing businesses, unless they were badly run. He had the SA massacred in the Night of the Long Knives because this part of the Nazi party did take the socialist elements of party programme seriously. The word ‘socialist’ had only been included in the name of the Nazi party – the National Socialist German Workers’ Party – against bitter opposition by some of its founders. Hitler stated that he did so in order to steal potential recruits from the real left-wing parties. Furthermore, the Nationalist intellectuals who first advocated a right-wing ‘socialist’ order in the 1920s stated that they did not refer to the nationalization of industry, but to the socialization of people to serve the state. And just before the Nazi seizure of power, Hitler made a speech to German industry stating that Nazism would protect private industry. The regime which the Nazis proceeded to establish is fairly described, by the very nature of the major interest which sponsored it, as a dictatorship of monopoly capitalism. Its “fascism” is that of business enterprise organized on a monopoly basis, and in full command of all the military, police, legal and propaganda power of the state. (p. 33, emphasis in the original). He lays out the essential capitalist nature of the Nazi state as follows on pages 41-2. 1. Productive Property and natural resources are to be privately owned; freedom of contract is guaranteed (excepting to “aliens” and the peasants under the Inheritance laws). 2. Individual initiative, the business entrepreneur, conduct of business for profit (“reward for services performed”), and ownership (individual or stockholder) control are basic. 3. Business men are to be free, if “responsible” (“self-government in business”), to fix by agreement prices, production totals and quotas, marketing areas, and the conditions and terms of purchase and sale. 5. Heavy industries, particularly those catering to the military and foreign trade, are encouraged; large-scale units, unless “uneconomical” are to be kept intact; co-operatives are to be broken up. 6. The social class structure of society is sanctified, strengthened, made semi-hereditary, and hardened into caste lines (Standestaat, class state); the “Middle Class” are the Myrmidons of the Elite (Fuhrerstaat, leader state) and, as such, the backbone of the state. 7. Employers have practically complete control over workmen in regard to wages, hours, and working conditions. They must “take care” of their workmen-i.e. see that they are fed and do not grumble. 8. Collective bargaining is completely abolished; strikes are illegal; trade unions are forbidden; requests for wage increases are lese majeste. 9. Control is completely from on top; there is and can be no such thing as control or discussion of policies from below; the “leaders” decide all things as they see fit; each holds appointed office for indefinite periods at the will of his superior. 10. The National Socialist Party and the German State are one and inseparable, as spirit and body. Legislative, executive, and judicial authorities are fused together. The central government controls all local government and all activities in all their details. 11. 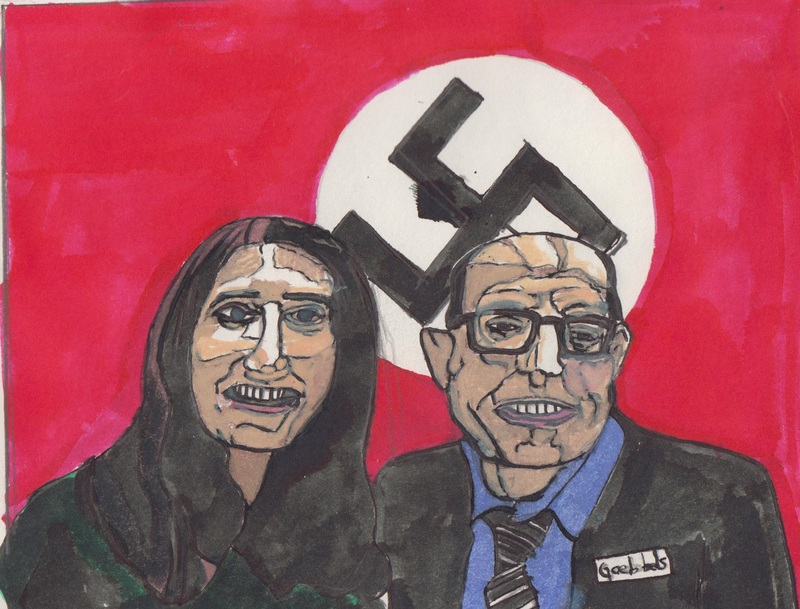 Civil and military are fused together; as in the military there can be no freedom of speech, of assembly, of writing, of acting, of “thoughts.” “Anyone may grumble or criticize the government who is not afraid to go to a concentration camp.” (Goebbels). 12. Germany must be made self-sufficient at all costs. (Autarkie). 14 Communism (Bolshevism, Marxism) is the major enemy. There can be no such thing as equality of rights, opportunities, or income for classes, races, or sexes. The “broad masses” are fools and must be duped and led to meet the purposes of the elite (Herrenstaat). Class war is the major crime; material rewards for the rank and file sheer folly. 15. All sciences and “culture” must be co-ordinated and made to serve the purposes of the “leader,” “total,” “corporate” “master” (Herren)state. propaganda is the method. Propaganda knows neither right nor wrong, neither truth nor falsehood, but only what it wants. In fact, business autonomy was severely limited by the imposition of the apparatus of state planning as Nazi Germany became a centrally planned economy similar to the Soviet Union, though in the case of Germany and Fascist Italy the economy was still very definitely capitalist private industry. Brady also goes on to discuss in his book how the Nazis celebrated and lauded the businessman as biologically superior through their social Darwinist ideology, and made sure that the leaders of industry, whether state-owned or private, were all drawn from the private sector. Nazi rhetoric was anti-capitalist, but by this they meant free trade, which they identified with the Jews, just as they claimed the Jews were behind Socialism, Communism, the trade unions and other left-wing movements. They also borrowed some elements from Communism. Fellow Germans were ‘national comrades’, rather like the Marxist use of the term ‘comrade’ to describe a fellow Communist. However, it is clear from this that Nazism was deeply Conservative and capitalist in its economic and social policies, and bitterly anti-socialist. It had socialist elements, but they were not taken seriously and only ever used as propaganda against the genuinely socialist parties and organisations. Any description of the Nazis as really socialist is utterly false and a lie, a rhetorical attempt to discredit contemporary socialism through guilt by association, and must be seen as such. Mike put up a piece last night responding to another malign comment uttered by Michael Gove. Gove is the former cabinet minister responsible for education, and so can fairly be blamed for a good portion of the problems now affecting our educational system. He’s a close of ally of Boris Johnson, though this didn’t stop BoJo stabbing him in the back over Brexit. Nevertheless, he showed his loyalty to Boris, as well as his complete ignorance and utter incompetence in the case of Nazanin Zaghari-Ratcliffe. This was the British woman of Iranian origin, who went back to Iran on holiday. She was visiting relatives, but the Iranians threw her in jail on the trumped up charge of spying. Boris made her situation worse by claiming that she was teaching journalism. She wasn’t, and Johnson’s comment was seized on by the Iranians as confirmation of their own allegations that she was trying to overthrow the regime. Gove then appeared on TV to support Boris, and declared in an interview that ‘we don’t know what she was doing’. This was wrong, and showed Gove really didn’t know what he was talking about. And it just made matters worse for Zaghari-Ratcliffe, who used his stupid comments as more proof of espionage and put more years on her sentence. Now Gove has waded in to give his considered thoughts on the current scandal of the deportations of the Windrush generation and their children. OH no! cried Gove, it’s not that bad. It’s just been ‘weaponised’ by the Labour party to divert attention from the massive anti-Semitism in their ranks. No, Gove, it isn’t. As Mike points out, the evidence shows that anti-Semitism in the Labour party has actually fallen under Jeremy Corbyn. But this won’t matter to the Tories. Like Goebbels, they prefer to repeating a good, useful lie until people believe it. Well, it worked with a lot of people under Thatcher. There’s always the possibility, however, that Gove really does believe what he says, or, just as likely, he’s so ignorant of the facts and the issues involved that he doesn’t know any better. Just like he didn’t know better than to mug up on the real facts before holding forth about Nazanin Zaghari-Ratcliffe. The deportation of the Windrush generation is important for a number of reasons. Firstly, it’s a vile, racist policy in itself. But it’s also offensive and dangerous because, as Lammy shows, they were British citizens. The Social Contract theory of government states that political authority arose when the early human community joined together to elect a powerful figure – a king- to protect their lives, families and property. The theory was first formulated in Ancient Greece, where it was taken over by Plato. It was the basis of some medieval theories about the origins and duties of kingship, and formed the basis of the political theories of John Locke and Thomas Hobbes. It has also been used to argue for the people’s right to remove their sovereigns and leaders, and to form democratic, representative governments. Social Contract theory’s been more or less rejected by scholars. One of the reasons is because their almost certainly was never a primal meeting of the early human community, to elect a leader using legal terms that wouldn’t exist until thousands of years later. Even so, it has still be influential. Rawls attempted to defend it, or advance a similar theory, in his A Theory of Justice. And it remains true that one of the very basis, essential functions of government is to preserve the lives and property of its citizens. But this the Tories have signally not done. They have decided to remove the basic right of citizenship from the Windrush migrants, simply because of their ethnicity. This has led to their deportation from a country, in which they have every right to live, and the denial of other essential rights. Like cancer treatment under the NHS, and other basis services to which they are entitled. Not that this bothers the Tories. They’re whole attitude to government is based on marginalising and depriving the poorest, most vulnerable sections of the population in order to give more wealth and power to the rich elite. Hence the attacks on the poor, the unemployed, the disabled as well as the normal attacks on immigrants and ethnic minorities. This is what has made the deportations extremely dangerous. It has shown that the Tories regard basic citizenship not as a right, but a gift that can be withdrawn on a whim or for reasons of political expediency. This is not about Labour trying to use it to deflect attention from the anti-Semitism smears and witch hunt in its own ranks. This is about protecting a group, that has been subject to a monstrous injustice, and preserving fundamental civic rights. Not that you can expect Gove to admit to all this, as someone who has constantly supported the Tories’ persecution of marginal and underprivileged groups. It’s time to get him, Tweezer and the rest of them out of office.